Outstanding picture quality with 1080P full HD display. Best-in-class features. Doesn’t fit for low budget home cinema system. Why to settle for a smaller screen when you get incredible television watching experience on 60-inch Smart HDTV? Hot selling Samsung UN60FH6200FXZA 60-inch LED Smart HDTV with ultra high definition 1080P video quality is our pick of the day for detailed review. This wide screen master piece brings ultimate movie watching experience you ever get in other models. This model comes with tons of great features to offer high level of user satisfaction. Let’s have a closer look on its specification and performance. This Smart HDTV from Samsung comes with 1080P full HD display. The display quality is outstanding with clear crisp images and natural looking color detail. This model makes use of Samsung’s all latest technologies to bring life-like video display. This Smart HDTV has ‘Clear Motion Rate’ of 240 which ensures sharp, crisp and high quality display for moving images at frame levels. This model also has ‘Wide Color Enhancer Plus’ technology which brings new life to old standard definition movies. 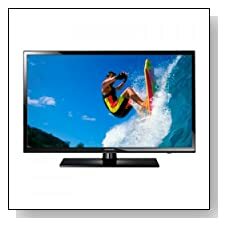 With this Smart TV you never miss anything, it supports full web browsing along with social networking support. You can stay connected with your friends on Facebook, Twitter and also read online new papers, weather reports, blogs without need of a computer. It has built-in Wi-Fi technology for high speed internet access. This model also has Wi-Fi Direct technology – which is even missing in many latest tablets – through which media files stored on other devices can be played on HDTV wirelessly. This TV has two 10W inbuilt full-range speakers with SRS TheaterSound® HD technology which gives very good audio quality. Samsung provides smartphone apps to make use of smartphones to control HDTV functions. ATSC/Clear QAM Tuners are integrated within the TV, it doesn’t need extra cables or converter boxes for catching channels. This ‘Energy Star 6.0’ certified TV also supports media playback from USB flash drives. All these technologies from Samsung bring ultimate HDTV watching experience. Samsung UN60FH6200FXZA has tons of other features apart from few listed above. Performance and quality of this model was more than what our review team expected. Its best-in-class features and incredible 60-inch 1080P HD video quality will surely redefine home cinema watching experience. Considering its performance, quality and offerings, our review team found this product worth for buying. If what you need is a TRUE HDTV watching experience and budget is not a constraint, then Samsung UN60FH6200FXZA is for you. Click here for a closer look.